Directed by Jeff L. Lieberman. USA. 2015. 110 min. With musical proclamations like Mississippi Goddam and an iconic style as the “High Priestess of Soul” Nina Simone is beloved and often misunderstood. Eleven years after her death, Simone is more popular than ever, and in 2015 was the subject of the acclaimed documentary What Happened Miss Simone, as well as the controversial biopic starring Zoe Saldana. President Barack Obama listed Sinnerman in his top 5 favorite songs, and whether remixed, resampled or in its pure form, Simone’s music continues to empower people around the world with its unrelenting appeal for justice. 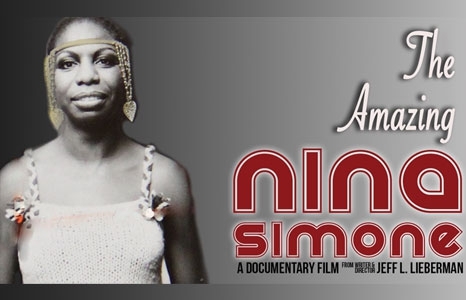 Extensively researched and drawing the inside story from more than 50 interviews with Nina’s family, friends, band members, lovers, and fellow activists, The Amazing Nina Simone is the first film to do justice to her uncategorizable art and complex personality. Filmmaker Jeff Lieberman worked closely with Simone's three surviving brothers, as well as her one-time manager, to give new insights into her musical journey from the segregated South, through the worlds of classical music, jazz joints and international concert halls, to her education among Harlem’s intelligentsia, the creation of more than 30 albums, her role in the civil rights movement, her struggle with mental illness, her self-exile to Liberia and France, and late-life comeback. Read the Seattle Times review.